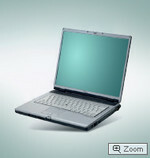 ATI Mobility Radeon X1400: ATI Mobility Radeon X1400 is part of the lower middle class. The performance can be compared with an elder X600, but technically it is a X1300, which is scarcely 100 Mhz higher clocked. Only some 3D games with very low demands are playable with these cards. » Further information can be found in our Comparison of Mobile Graphics Cards and the corresponding Benchmark List.